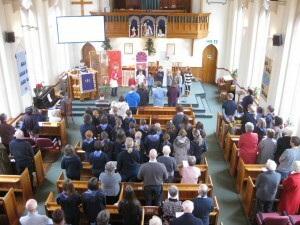 Family worship is held every Sunday at 11am. Our worship is comforting, inspiring and challenging. We try to open ourselves to the whole spiritual dimension of life. Communion is held on the third Sunday in each month. All visitors are made welcome at our services. There is a ramp at the front of the church for wheelchair access. The worship area is fitted with a loop system. 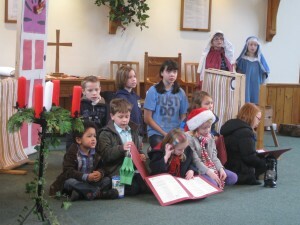 These are children from Junior Church taking part in a service. After a short session of Family Worship the children go to Junior Church to worship at a level which will lead them to be able to make their own decisions about religion as they mature.